My Mom and sister are here visiting from Ohio to go to our youngest son's wedding. I had made the darling bridal couple these wedding goblets and we decided to make some for my kitchen table. You can check here for the directions on how to make them. I want to join Kathleen's Let's Dish! on Wednesday night at 7 pm. Check out all the other ideas at this fun party. Here's my Mom and Sister ready to toast !! A sweet, little treat to end a meal! Mix the pudding and milk together for two minutes. Fold in the whipped topping and the orange zest. Fill the shells and you have a yummy dessert!! Top with a fresh berry and/or chocolate curls. You will have leftover pudding mix to enjoy later. I found this delicious soup recipe from the March 2011 issue of Southern Living. I've adapted the preparation slightly for easier clean up. We enjoyed this soup very much. Bring rice, 4 cups chicken broth and 1 seasoning packet from rice mix to a boil in a dutch oven over medium-high heat. (Reserve remaining packet for another use.) Cover; reduce heat to low and simmer 20 minutes or until liquid is absorbed and rice is tender. Meanwhile, melt 3 T. butter in a large skillet over medium heat, add mushrooms, onion, and celery and cook, stirring often, 10-12 minutes or until tender. Remove from the skillet into a bowl and set aside. Melt 1/4 cup butter in the same skillet. Whisk in flour and cook, whisking constantly for 1 minute or until thickened and bubbly. Gradually whisk in remaining 6 cups broth and cook, stirring often for 8-10 minutes or until slightly thickened. Whisk in half- and -half and wine. Add all of this, along with the reserved mushroom mixture and the chicken to the rice in the dutch oven. Cook, stirring occasionally for 5-10 minutes or until heated through (Do not boil.) Garnish, if desired. When I saw Ann from Sutton Place's post on a nesting bunny, I knew what I wanted to make. I already had bought this cute bunny from HomeGoods, which I bought when I saw how well it blended with my quilted table topper. I used my grandmother's basket, which is probably at least 80 years old and filled it first with bubble wrap (to keep the table clean!!) and then moss from the Dollar Tree. I sprouted some pink flowers (50% off) from Hobby Lobby to add some color. I also changed the bow out on the bunny with some bright pink tulle. Last year, on a visit to Home Goods, I found the lime green polka dot salad plates!! I love buying salad plates to go with my Mikasa English Countryside dinnerware. I made this Big Star quilt for my Easter kitchen table. I loved the bunny pattern and the bright pink polka dots to coordinate. Here's the quilt in detail. How about a cup of tea, in the tea cup painted by my late, Great-Aunt Kitty? I tied some more of the tulle around the silverware and napkin. Last Spring, I saw this great idea for coloring deviled eggs after they are hard-cooked, on happierthanapiginmud.blogspot.com/. Lynn always has fun ideas for food and great recipes. I tried it last year and I thought this would be perfect for a fun Green Eggs and Ham meal. It's just TOO FUN of an idea not to share, for Spring time meals, or any time, for that matter. For eggs, put the amount you want into a saucepan, cover the eggs with an inch of water over the tops; bring to a boil. When the water comes to a boil, remove the pan from the heat, cover and let sit for 10 minutes. Remove the eggs from the water and immediately plunge into a bowl of ice water. I usually roll them around to crack the shells and let them sit for about 5 minutes. They then can be easily peeled. You will need about 1 t. white vinegar, food coloring and about 1 cup of hot water. For 5 eggs and wanting them all green, I used 1 T. white vinegar, green food coloring and 3 cups water. I put the peeled, hard-cooked eggs sit in the water for about 7 minutes, as Lynn suggested. I used a wavy food cutter to slice the eggs, popped out the yolk into a bowl and used a pastry blender to smash up the yolks. Usually people like the filling that their Mom made and I'm no exception!! I use a little vinegar & sugar, salt and pepper, a little milk to make it creamy (but not too creamy), a couple of tablespoons of mayo and stir it all up. You then can spoon into the white of the egg or pipe it in. I used a Wilton Dessert Decorator that you can buy at Wal Mart. It's great when you don't have a huge amount to decorate. Mix together the cake mix, pudding, oil, water, orange juice and eggs and beat with mixer on low for 30 seconds and then on medium for 2 minutes. Pour 3/4 of the batter into a greased & floured 10" tube or bundt pan. Into remaining 1/4 batter, add 3/4 cup chocolate syrup. Mix and pour over top of other batter. Bake at 350 degrees for 50-60 minutes (until toothpick comes out clean). Cool on wire rack. Remove from pan. You can sprinkle with powdered sugar or make a chocolate glaze. Note: I made 10 mini bundts, but 11-12 would be better, as mine were rather full!! I baked them for about 30 minutes. In a small bowl, combine powdered sugar, cocoa and butter. Add vanilla & add milk gradually to achieve desired consistency & stir until smooth. Excuse me while I have a bite! I'll save you one! Here's yours in my cloche!! I love decorating for St. Patrick's Day and making a special meal. The only European country my hubby & I have been to, is Ireland, and it was our dream vacation. The countryside in Ireland is just a gorgeous patchwork of shades of green. I thought I'd share our St. Paddy's Day table, which also includes various green colors. How about a cup of Irish tea? This recipe was featured on The Doctor Oz Show and was developed by Jorge Cruise. I was a little skeptical, but it actually tastes good & really kept me full for about 5 hours, which is a good thing. 50 seconds in the microwave! Mix all ingredients in a microwave safe coffee mug. Cook for 50 seconds in the microwave. Turn upside down on a plate & enjoy! The muffin looks like a top hat on the shamrock! Cut up with a little butter. Do you think they'd notice if I cut out a piece for me??!! My DIL made these for a family function & we all loved them!! I'm making them to send along for my son's bachelor party. The guys are going to a cabin & I'm sure a yummy dessert will be appreciated. If you need a really quick, delicious treat & you LOVE chocolate & peanut butter (not to mention the marshmallow creme part --my favorite!!!) please try these. You will love them! 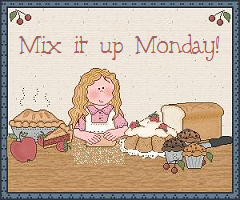 I was featured on Mix it up Monday! !